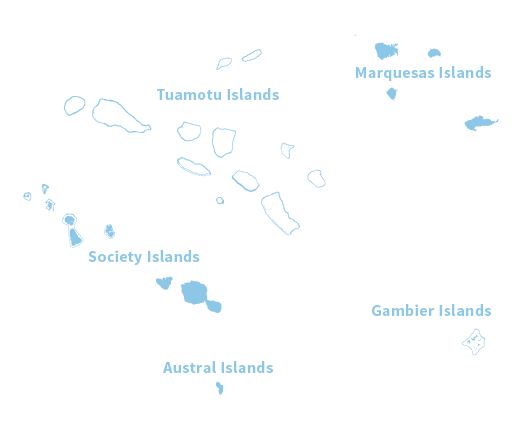 Surrounding one of the world’s greatest destinations for scuba diving, the 240 islets string together in the ocean for more than 110 miles (177 km), completely encircling a deep lagoon. This is Rangiroa, a place that is simply beyond human imagination. Also the world’s second largest atoll, Rangiroa is a place where land and sea form an unexpected truce. The beautiful loop of islands is surrounded by different kinds of ocean: Moana-tea (Peaceful Ocean), which defines the lagoon, and Moana-uri (Wild Ocean), where whales, manta rays, dolphins and sharks put on a show for the lucky few who come to experience their world. 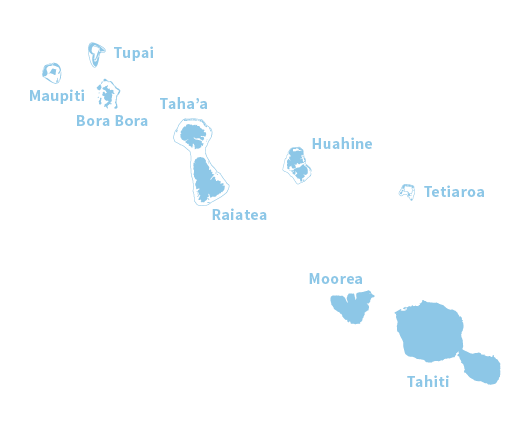 Back on land, the main villages of Avatoru and Tiputa offer the visitor a unique look at the South Pacific. Along the few roads that exist, you’ll encounter coral churches, craft centers, local restaurants and boulangerie, along with a few tiny shops operated by locals. Wine lovers can also enjoy wine tasting at the Dominique Auroy Estate nestled within a coconut grove, which produces three grape varieties, and black pearl farms, which dot the lagoon. Rangiroa is renowned worldwide for its breathtaking dive spots. Whether you take an intro dive or just a fun dive exploring the lagoon, passes and reefs, beginners and experienced divers will be blown away by the abundance and colors of the marine wildlife. Schools of multicolored butterfly fish, turtles dolphins and sharks swim just beneath the surface, just waiting for divers to visit them in their underwater paradise. 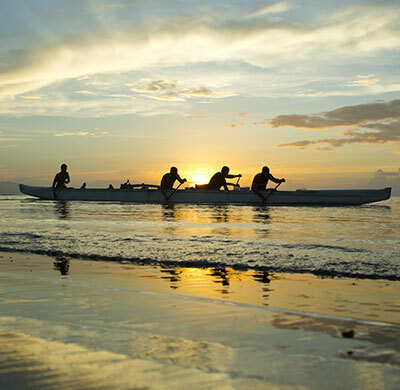 Rangiroa or Ra’iroa means “endless skies,” which makes it the perfect name for the second largest atoll in the world. 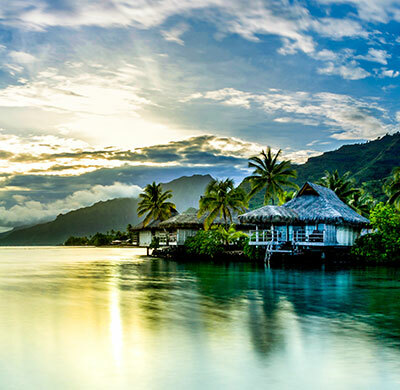 In fact, to give you a sense of the lagoon’s scale, the inside of the lagoon is so large it could hold the entire island of Tahiti. 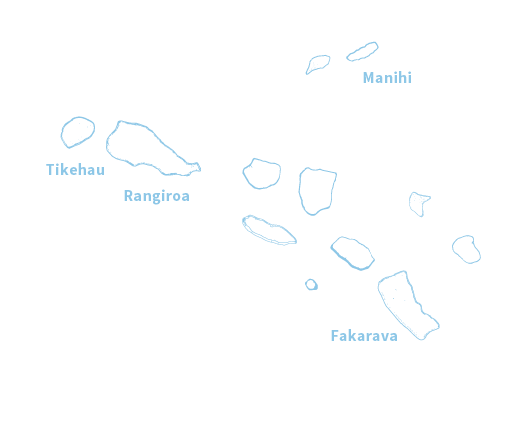 The local people in Rangiroa mostly live on two of the hundreds of motu circling the atoll: Tiputa and Avatoru, close to the two passes holding the same name allowing access to the ocean. Even if you’re not a diver, you can still discover the beauties of the lagoon from above the water’s surface. The possibilities are endless on Rangiroa. You can opt to go for a picnic on a desert motu, go snorkeling above the incredible coral gardens, visit untouched islets where wild birds nest or, if you’re feeling adventurous – have fun with small, friendly sharks. A couple of must-sees include the “blue lagoon,” where nature gave birth to a small lagoon within the main lagoon, as well as the “pink sand beach,” another beautiful area to discover. These sand dunes emerge from the reef and naturally crushed seashells have given this amazing pink hue to the area. 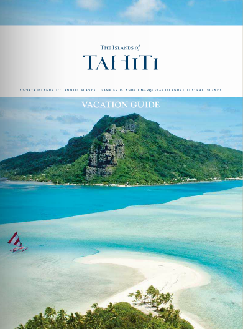 There are many ways you can experience The Islands of Tahiti. Let’s take the many ways you can explore the water, for example. You can dive under it, surf over it, or even picnic in it.